What Is Included in the Saxophone Family? The alto saxophone is the most commonly played version of the instrument. The saxophone family includes a large number of instruments. Although there are many types of saxophones, there are four types that are popular — the soprano, alto, tenor, and baritone saxophones. The alto saxophone is the most commonly played version of the instrument. A saxophone is a type of woodwind instrument. Its sound is made by blowing air through the mouth piece. A wooden reed, which is a part of the mouthpiece, vibrates as air passes through and produces sound. Saxophones are typically made out of brass alhtough they have been made of a number of different metals as well as plastic. The history of the saxophone family begins with Adolphe Sax, who invented the first saxophone. Sax was a Belgian musician and instrument maker. In 1841, he created the saxophone which he named the brass horn. His saxophones were produced in a range of sizes and tones and established the saxophone family that is known and used today. One of the smallest instruments in the saxophone family is the soprano saxophone. The soprano saxophone plays high pitched tones and may resemble either a miniature alto saxophone, with a curved bell, or a clarinet, with a straight bell. Curved-bell soprano saxophones sound much like a regular saxophone while straight-bell saxophones may sound more oboe-like. 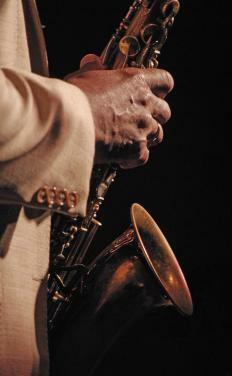 The alto saxophone is the most commonly played instrument in the saxophone family. It is in the key of E flat and is almost always found in the traditional backward "j" shape that saxophones are known for. The alto saxophone is commonly recommended for beginning students as its size makes it easy to handle and play. Tenor saxophones are one step larger than the alto saxophone, and they play one octave lower than the soprano saxophone in the key of B flat. The tenor saxophone looks slightly different than the alto sax because there is a slight bend in the neck of the instrument. The odd shape of the neck makes it prone to damage so the owner must be careful while handling it. Baritone saxophones are the largest of the commonly played saxophones and plays the lowest tones, one octave lower than the alto saxophone. The baritone is so large that it must sit on a stand and be harnessed to the musician to stabilize its weight. This instrument is very large, but it is also very delicate because of its size and is prone to damage. Although these are the four most common instruments in the saxophone family, there are a wide variety of saxophones available. The smallest and highest pitched saxophone available is the sopranissimo which is only 12 inches (30 centimeters) long. The largest type of saxophone is the contrabass which is not only the biggest saxophone but also the largest woodwind instrument. It is very rare. What Is a Baritone Horn? What Are the Advantages of a Plastic Clarinet? What Is a Contrabass Clarinet? What Are the Advantages of a Wooden Clarinet?